Breaking news and analyses on alternative energy sources, technology and implementation. 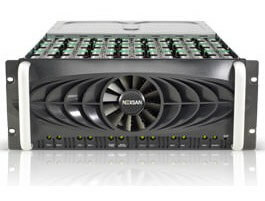 Nexsan announced the next-generation Nexsan BEAST storage array. This practical, accessible, cost optimized storage workhorse has been engineered to deliver superior reliability, availability and energy efficiency, along with storage density that enables 60 drives, or 480TB, in a standard 4U rack, expandable up to 4.8PB in a 42U rack. The latest generation of the well-known Nexsan SATABeast-branded storage array, the new Nexsan BEAST delivers up to 85% power reduction through the use of AutoMaid disk management technology. This reduces operational expenses and extends the overall life of the system, both conserving energy while optimizing performance. Designed to accommodate 3.5 in SATA drives in a dense space, Nexsan BEAST systems don’t require the use of extended racks. Innovative mechanical design, including Cool Drive Technology and anti-vibration design, significantly reduces heat and head vibration in the unit for improved system reliability and performance. Nexsan BEAST systems are also fully redundant with hot swappable components including controllers, hard-disk drives, power supplies and fans. As part of GEV’s quality-assurance mapping process, all turbine generators will also be inspected after construction. 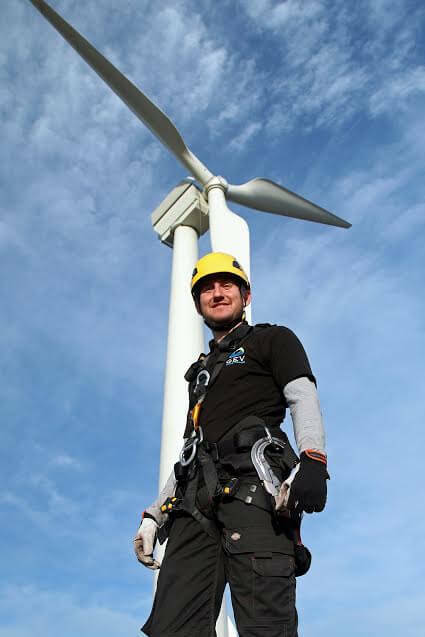 With over 90% of turbine blades being damaged to some degree in transit, GEV Wind Power has identified a gap in the market and developed an innovative factory-to-site Quality Assurance Programme to offer clients peace of mind during the transit of wind turbine blades and generators. The new scheme assists in maintaining the industry’s exacting installation schedules, which are often hindered due to unexpected repairs being undertaken. As part of the quality-assurance mapping process after construction, all wind-turbine generators will all also be inspected using the GEV Wind Power Panoblade camera system. The electric grid in the United States suffers from multiple issues, including inefficiency and high cost. Smart technologies have been touted to solve these and other operational difficulties. Yet, a shift can bring its own problems as well. Mixing power delivery with digital technologies opens up the possibility of disruptions caused by malicious entities. This threat must be seriously considered and mitigated with a carefully crafted strategy. To learn more, checkout the infographic below created by the New Jersey Institute of Technology’s Online Masters in Electrical Engineering program. What most people do not know is that a large part of the U.S. electric grid was actually built post-World War II. The early designs were based on Thomas Edison’s work, which underscores just how old they really are. The entire system is made up of over 7,000 power plants that are responsible for generating energy and ending this out through 450,000 miles of high voltage transmission lines and 2.5 million miles of feeder lines. 3,300 utility companies, that serve the needs of 150 million customers in different states, manage this massive network. The estimated value of the system is at $876B. Homes and business both need an uninterrupted supply of electricity. Any disturbance can cause major problems. It is disconcerting to note that power outages in the US have shot up 285% since 1984. What’s more, the country lags behind other industrialized nations in terms of the average length of outages. The result is up to $96B in losses for the economy, with as much as $70B coming from weather-generated outages. To put things in perspective, just one hour of power interruption can wipe out $2M from semiconductor manufacturing, $2.5M in credit card operations, and $6.5M in brokerage operations. So, what actually is a “smart grid”? It is the infusion of advanced communications and control strategies to the electricity delivery systems using modern technologies with the aim of improving efficiency, security and reliability. Proponents do not hide the fact that this shift will require a large investment but they argue that the resulting savings make it a worthwhile endeavor. The Electric Power Research Institute estimates the cost to be between $338 and $476B over a 20-year period. The change is already happening with almost 2 million advanced metering infrastructure installed in 2013 and about 65 million smart meters to be installed nationwide throughout 2015. The foremost benefit of the shift is increased energy efficiency. This happens in two ways: a reduction in energy use and a decrease in transmission losses. More of the power generated in the plants will be able to reach the end users. Next is the boon to the environment. Using advanced technologies is projected to lower overall carbon dioxide emissions by 58%. There will be a significant reduction not only in greenhouse gases but also in other pollutants. 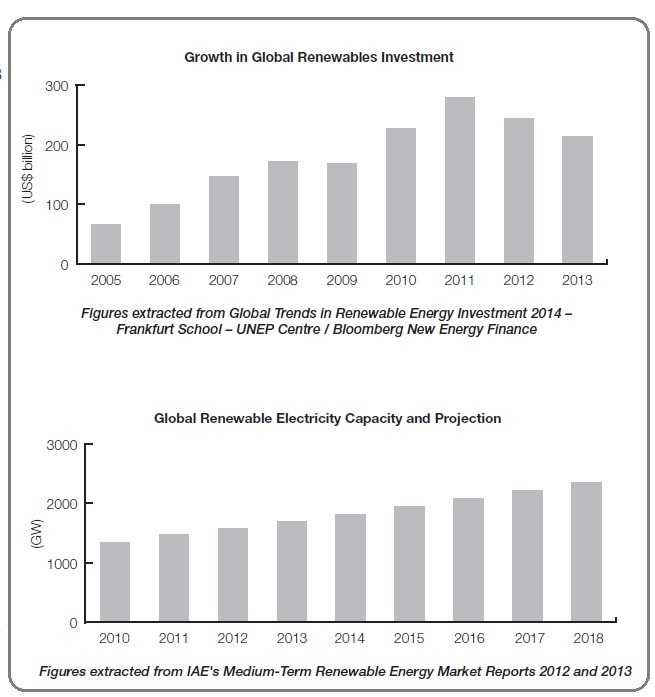 What’s more, there is stronger support for renewable energy sources. Gasoline-powered vehicles will also be more readily replaced with plug-in electric vehicles. As for the direct financial benefits, the improved resilience to power disturbance will save the U.S. economy roughly $49B every year. Customers will collectively enjoy as much as $2T in benefit over the next 20 years. On the other hand, everyone needs to watch out for the potential risks. These include increased exposure to attackers, network vulnerabilities, compromised hardware, more opportunities for denial of service attacks and breaches of customer privacy. The top vulnerabilities are related to privacy and cyber security. For privacy, understand that 5 million smart meters read once every 15 minutes will produce 14 petabytes of personally identifiable information. Regulatory requirements could demand that this information be kept for a minimum of 7 years. The gargantuan network is at least 100× bigger than the Internet making management and monitoring quite difficult. For cyber security, experts warn that a major cyber attack on the electric grid could have devastating consequences on the US economy. The damage can reach $1T in losses and a further $71B in insurance claims. This fear has real basis with 15 suspected cyber attacks on the US grid since 2000. Personally identifiable information needs to be protected to gain consumer trust. The system should have solid host-based defenses against outside and inside attacks. There must be an annual assessment to spot vulnerabilities and deal with them. There should be virtual private network support, a robust authentication protocol and third-party review to plug all the gaps. Haydale, the developer of a unique plasma functionalization process for nanomaterials, has announced the publication of research showing its graphene nanoplatelets (GNP) significantly improve the nano-reinforcement of resin. The research, conducted by the Material Science Department at AeroSpace Corporation, has been published in the Journal of Applied Polymer Science. The Haydale development is significant because graphene is highly inert, and is subsequently difficult to bond it with or disperse it within other materials. The development is significant because graphene is highly inert, and is subsequently difficult to bond it with or disperse it within other materials. 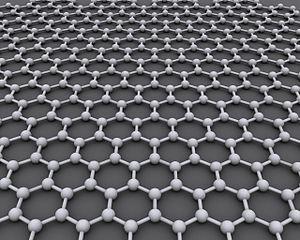 Current methods for treating or functionalizing graphene involve thermal and chemical shocking agents which whilst allowing for scalable production, can cause significant damage to the material’s structure, leading to defects in the final product. The report states significant strength improvements in toughened epoxy composites, in particular, a greater than two-fold increase in tensile strength and modulus of an epoxy composite using a number of HDPlas O2-functionalised GNP, manufactured by Haydale. The addition of increasing amounts of GNP resulted in strength increases of over 125% and toughness improvements of 100% over that of similarly cured, unreinforced material. The results underline the potential Haydale’s tailored, plasma functionalization process has for providing the material’s potential. The research results show the possibility to increase tensile strength and tensile modulus, which opens the possibility to design longer, stiffer, or lighter wind turbine blades. An important additional property implied by the results is that the strain to failure was not compromised by these increased tensile properties, implying that the toughness was maintained, which could result in more damage tolerant blades – i.e. to avoid catastrophic failure in an overload situation. Similar performance enhancement would be expected for other composite structures. 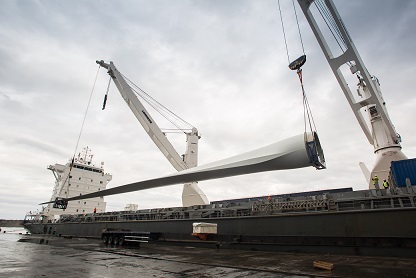 Longer turbine blades could benefit all aspects of wind power production. 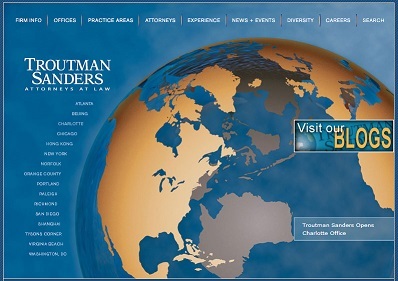 This article, from law firm Troutman Sanders, provides a little insight as to how utilities decide on a return on investment. At FERC’s monthly meeting in June, the Commission tentatively set the base return on equity (“ROE”) in ISO New England Inc.’s (“ISO-NE”) Open Access Transmission Tariff (“OATT”) at 10.57%. During the process, FERC announced a new method to calculate ROEs for jurisdictional electric utilities. Specifically, FERC’s new method will incorporate short and long-term measures of growth in dividends, thus incorporating the two-step discounted cash flow (“DCF”) method FERC already uses in setting rates for natural gas and oil pipelines. As applied to the ISO-NE ROE proceeding, FERC tentatively used the gross domestic product (“GDP”) as its long-term growth rate estimate, subject to a paper hearing established by FERC. The Commission also determined that, based on the record established in the ISO-NE ROE proceeding, the appropriate base ROE for ISO-NE’s OATT should be set halfway between the midpoint of the zone of reasonableness (9.39%) and the top of the zone of reasonableness (11.74%). By way of background, New England transmission owners (“TOs”) recover their transmission revenue requirements through formula rates contained in ISO-NE’s OATT. Under the ISO-NE OATT, the formula rates are calculated according to a single base ROE. In 2006, the base ROE for the New England TOs was set at 11.14%, consisting of a base of 10.4% with an upward adjustment of 74 basis points accounting for changes in capital market conditions—specifically, the yield of 10-year U.S. Treasury bonds. On September 30, 2011, a group of state utility regulators in the New England area (“Complainants”) filed a complaint at FERC arguing that, due to changes in capital market conditions since the base ROE was established in 2006, the 11.14% base ROE had become unjust and unreasonable and should be lowered. Complainants further asserted in their complaint that their DCF analysis demonstrated that the zone of reasonableness used to calculate the base ROE should be 7.0% to 11.4%, with a midpoint of 9.2%. Based on this analysis, Complainants argued that the base ROE should not exceed 9.2%. FERC set the matter for hearing. On August 6, 2013, Administrative Law Judge Michael J. Cianci issued an Initial Decision, finding that the base ROE of 11.14% was unjust and unreasonable, and concluded that two defined time periods would be appropriate when determining a new base ROE. The Initial Decision recommended a higher ROE for an initial 15-month refund period – beginning one day after the complaint was filed and ending on December 31, 2012 – because Judge Cianci found that the cost of equity evidence for that time period required higher base ROE percentages. Judge Cianci then concluded that the base ROE for the refund period should be set at 10.6% and the base ROE for the following prospective period should be 9.7%. Although Judge Cianci generally accepted the New England TOs expert’s zone of reasonableness, Judge Cianci used the midpoint of the zones, reasoning that it conformed with traditional DCF analysis adopted by FERC, instead of halfway between the midpoint and the high end of the zone of reasonableness, which the New England TOs recommended. In its order, FERC decided to adopt a two-step method when calculating the base ROE for jurisdictional public utilities, thus incorporating long-term growth rates into its analysis. Acting Chairman Cheryl LaFleur stated that adopting the new method “appropriately narrows the zone of reasonableness in the DCF analysis.” Also, FERC decided to eliminate its past practice of using U.S. Treasury bond yields to make adjustments to the base ROE after the record in a hearing proceeding has been closed. While doing so, FERC reasoned that there is not necessarily a direct correlation between U.S. Treasury bond yields and a public utility’s ROE. Instead, FERC will allow parties to present the most recent financial data available at the time of the hearing – including post-test period financial data –to incorporate that data into the ROE analysis. Finally, FERC confirmed that a utility’s total ROE will still be capped at the upper end of the revised zone of reasonableness. With regard to the ISO-NE ROE proceeding, FERC reversed Judge Cianci’s decision to use the midpoint of the zone of reasonableness, and instead elected to use the halfway point between the midpoint of the zone of reasonableness and the top of that zone. FERC based its decision on several reasons established in the record presented in the proceeding, including (1) unusual capital market conditions, (2) the fact that FERC’s midpoint of the zone of reasonableness was lower than alternative methods used to calculate ROEs, and (3) the ROEs recently adopted by state public commission’s have generally been higher than FERC’s midpoint of the zone of reasonableness. Acting Chairman LaFleur stated that the base ROE set for the New England TOs “should set a level sufficient to attract investment in interstate electric transmission” and hopefully “provides appropriate guidance for the resolution of related ROE complaint proceedings” currently pending at FERC. Because the new two-step method adopted by FERC incorporates both short and long-term measures of growth in dividends, FERC tentatively decided to use GDP as a measure of long-term growth in the ISO-NE ROE proceeding. While such a practice is already used in the natural gas and oil pipeline industry, FERC established a paper hearing so that participants can present evidence regarding the appropriate long-term growth rate that should be used when calculating the base ROE for ISO-NE’s OATT. Subject to the long-term growth rate that is ultimately used, FERC tentatively found that the just and reasonable base ROE for ISO-NE’s OATT is 10.57%. Commissioner John Norris issued a separate opinion, dissenting in part from FERC’s order. During the meeting Commissioner Norris stated that while he generally thought that the base ROE for the New England TOs needed to increase, FERC’s order resulted in an ROE that was too high. Going forward, it appears that FERC may be more sympathetic to arguments raised by utilities advocating that FERC should adopt an ROE above the midpoint of the zone of reasonableness in order to attract sufficient capital investment and thus, build new infrastructure. However, it remains to be seen whether FERC’s decision to do so with regard to the New England TOs’ ROE will apply to other jurisdictional utilities’ ROE as well. Regardless, FERC will employ its newly adopted two-step DCF method to calculate such ROEs. This Flash Note from Make Consulting examines a few implications of the new carbon regulations for the U.S.power sector, particularly the impact on the wind power market in highlighted states. It summarizes the rule’s requirements and timeline. This Flash Note (for Make clients) analyses the plan’s effect on state renewable energy standards, REC markets, fossil fuel generation, power prices, and federal incentives. It also assesses the potential impact on MAKE’s U.S.forecast scenarios and opportunity for wind power. The safety glasses stayed in place and did not crack, split, or show any damage from the impact. “I believe I am alive because of the protection I received while wearing these safety glasses.” That’s just one comment by an end user of Gateway Safety products, whose sight – and possibly life – was saved by a pair of Varsitysafety glasses while riding his motorcycle. Traveling at 70 mph, a bird flew directly into his right eye. The force of the impact was so hard the rider blacked out momentarily, but he was able to regain control of the bike and safely come to a stop. “I truly do appreciate being alive to tell my story,” he says. More stories like this one are found on Gateway Safety’s website, which now features a “real life stories” page. The page is quickly filling up with impressive stories of Gateway Safety products in action, saving eyes and … even lives. Editor’s note: This introduction comes from the Multi-state ZEV action plan issued by the Sierra Club. It should be of some interest to the wind industry, because EVs will increase demand for utility scale generated power. For the full plan click here. Twenty-two plug-in electric vehicle models from nine manufacturers are expected to be available for sale or lease in 2014. Thirteen models run entirely on batteries and nine are plug-in hybrid electric vehicles that can run on gasoline as well as the battery. A number of these models are not currently offered for sale in all ZEV states. One hydrogen fuel cell electric vehicle model is currently available for lease in California and another two are expected beginning in model year 2015. The number and type of models available will continue to increase as manufacturers develop a portfolio of ZEV technologies to match their full product lines, which will further enhance consumer choice and market growth. Significant progress is being made to overcome the primary obstacles to the development of a robust ZEV market: consumer acceptance, availability of fueling infrastructure, and vehicle cost. Some dealers have been reluctant to aggressively market PEVs, citing a greater time commitment required to sell them and lower profit margins compared to conventional vehicles with internal combustion engines. However, the new generation of plug-in electric cars is receiving high grades from consumers who purchase them. Drivers rate the overall quality and appeal of PEVs more highly than ICE vehicles across a wide range of criteria. Consumer interest and ZEV sales are growing concurrent with the availability of top-rated models from an increasing number of manufacturers. In 2011, the Chevy Volt was named the ‘Motor Trend Car of the Year,’ with Motor Trend stating, “This automobile is a game-changer.” The Volt also won the Automobile Magazine ‘Automobile of the Year’ and ‘North American Car of the Year’ awards, and was included in the Car and Driver ‘10Best’ list. The Nissan Leaf was named the ‘World Car of the Year’ and the ‘European Car of the Year’ in 2011, and was noted in the Popular Mechanics ‘Breakthrough Awards’ of 2010, which stated that “the real triumph lies in its family-car practicality and normalcy.” For 2013, the Tesla Model S was named ‘Automobile of the Year’ by Automobile Magazine, the ‘Motor Trend Car of the Year,’ and Consumer Reports awarded the Model S a score of 99 out of a possible 100 in the magazine’s tests, the highest score any automobile has received. The availability of high quality vehicles that consumers like to drive resulted in more PEVs being sold in the past year than in all previous years combined. The United States has the largest fleet of plug-in electric vehicles in the world. In their third full year of sales – 2013 – about 96,000 PEVs were sold nationally, nearly double 2012 sales of 53,000 and more than five times first year sales of 17,500 in 2011. Sales of full battery electric vehicles increased by more than 330%, from 14,251 in 2012 to 47,694 in 2013. Automobile manufacturers offer a variety of pure battery electric, hybrid, and “assist system” models that provide growing consumer choice. The all-electric capacity for current models ranges from about 10 miles per charge to more than 250 miles. Plug-in hybrids and gasoline assist models are available for those needing a greater range or interested in enhanced flexibility. Online calculators are not new but the one sponsored on the EEweb site is unusual enough to warrant mention. For example, two lines of calculation appear on screen so you can compare one calculation to the following. The most used functions are on the keyboard and the handy sidebar tab pull up a unit converter, which may be worth the price of admission.